The fells of England's Lake District are etched with history. The wind came out of nowhere as I rounded the flanks of a small rise called Little Man and faced the final ascent toward Skiddaw’s summit, some 300 feet above. Great gusts rattled the edge of my hood and sent me reeling sideways off the rocky path. Everything was an opaque white, a swirling soup of fog and mist that rushed against my face and down my throat so fast I felt like I was choking. Turning my back to the current, I gasped a few measured breaths and contemplated whether it would be faster to finish the climb walking backward. My watch read 4.5 miles, and the Skiddaw Fell Race was supposed to by 9.6 miles round trip. The summit couldn’t be that much farther. Through the fog, I made out a hunched figure, head up, hands on knees, marching painfully but determinedly upward. I clenched my fists inside my jacket sleeves and turned back into the gale. His tales of leg-swallowing bogs and epic ultra-distance peak linkups established by innkeepers wearing Plimsoll tennis shoes had intrigued me. Here on Skiddaw (3,152 feet), England’s sixth-highest peak, I was discovering what exactly all the fuss was about. Wading through hip-deep bracken under typically gray Lake-District skies. Photo by James Carnegie. “Fell” is the name given to the round, sloping and surprisingly technical mountains of northern England, Wales and Scotland. It’s the region’s apocryphal weather and free-range running culture that sets them apart. Shepherds have been walking the fells for centuries, tending to their flocks, which roam freely on the grassy slopes. In fact, the first fell runners were shepherds. They weren’t running for fitness or for prize money. They were running to prove who knew the quickest way of navigating through their backyard mountains. In the canonical fell-running book Feet in the Clouds, Richard Askwith gives a basic primer on the sport’s history: in the mid-1800s, wealthy Londoners became inspired by the romantic poets Samuel Taylor Coleridge and William Wordsworth, and began to seek out leisure time in the mountains. Consequently, there came a need for mountain guides. Vacationers employed the men with the most intimate knowledge of the mountains: the shepherds. Competition for that business led to the organizing of guides’ races. Eventually, though, racing took on a life of its own. 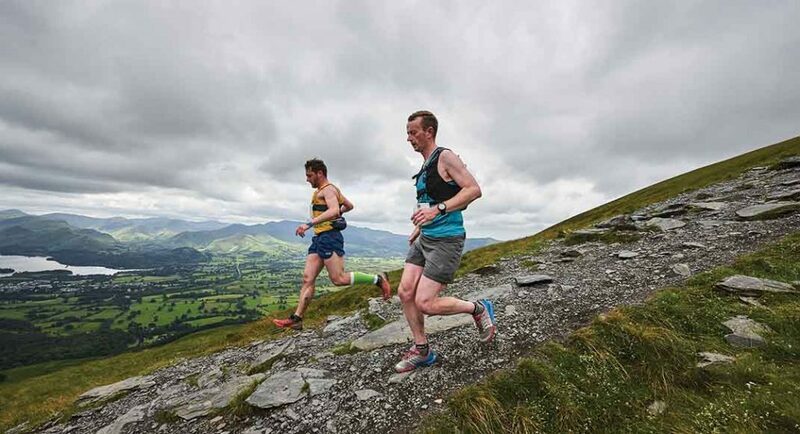 These original races were short and steep affairs—just a few miles, straight from town to the top of the nearest fell and back down. Most were held in association with local festivals, called “sports days” or “sports feasts,” which featured everything from wrestling matches and running races to hound-dog and bike races. Many of these festivals, and the fell races that go along with them, still happen today. Traditional fell races were—and still are—a choose-your-own-route affair. Runners scramble and claw their way up by whatever route they think is fastest, and hurdle back down in the same fashion. It’s a style that favors locals who have spent time on the fells, know them like the backs of their hands and “revel in finding the best line and beating a rival through tenacity, not necessarily speed,” says renowned fell runner Nicky Spinks, 50, of Yorkshire, England. The fellsides are steeped in legends of locals who many argue are among the best athletes Britain has ever seen—like Kenny Stuart, the gardener from Keswick who in 1984 ran the Skiddaw race (9.6 miles and 2,500 feet of climbing) in 1 hour 2 minutes, or Joss Naylor, the shepherd from Wasdale valley, who, in 1975 linked the summits of 72 fells in 24 hours (estimated at more than 100 miles and 37,000 feet of climbing), a record that would stand until 1988. Yet, mention these names outside of fell-running communities and you are likely to be met with blank stares. 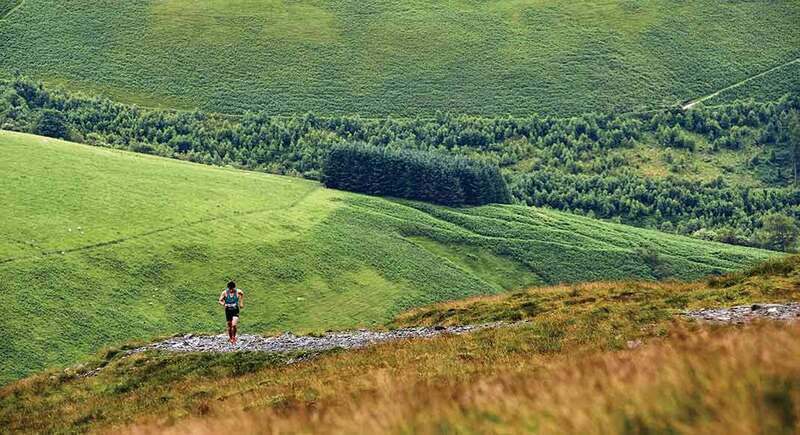 That’s because fell running is still a locals’ sport, beholden to the traditions, history and culture of the specific region from which it was born. Like roads leading to Rome or roots leading to a tree trunk, fell-running history, tradition and lore all trace back to the Lake District. Known colloquially as “Lakeland” or, simply, “The Lakes,” the Lake District lies in Cumberland County in the northwest corner of England. 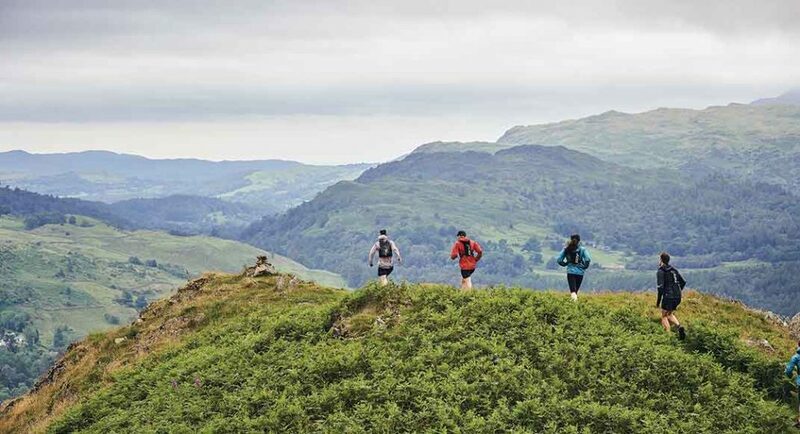 In an area of 900 square miles—roughly the size of Yosemite National Park—the Lake District boasts 214 named and recorded fells (according to the fell-walking guidebook Pictoral Guide to the Lakeland Fells, by Alfred Wainwright), including four of England’s six peaks over 3,000 feet. The Lakeland fells are broad and treeless, crisscrossed with unmarked paths worn in by generations of shepherds and, now, tourists. It’s easy—encouraged, even—to run off trail. The terrain includes everything from open, grassy hillsides to scree fields and cliffs. Fern underbrush, or “bracken,” grows like weeds, and the ground is pocked with loose rock and hidden bogs, which make it easy to either fall onto the ground or sink into it. The views stretch endlessly in all directions. I arrived in the Lake District on a gray Friday afternoon in late June 2017, along with a group of runners and journalists who had come from around the world to experience the fells and try our hands at a fell race. Our first stop was Keswick (pronounced Ké-zick), a small, lakeside town that looks exactly the way you’d expect northern England to look: a cluster of narrow, winding streets nestled between pastures and hillsides. The white houses have black trim, slate-brick siding and lace curtains. Sheep wander on the fellsides, which reach right up to the edge of town. The fells—great, gentle-seeming giants—rise in succession as far as the eye can see, their flanks a deep, grassy green, indistinguishable from the pastures below. “That one’s Skiddaw,” said Adrian Hope, a long-time fell runner who lives farther south, in Manchester, and commutes to the Lakes for running (and for work, also with inov-8). He pointed toward a green-brown-gray massif that hulked just above town, its 3,152-foot top shrouded in cloud. On Sunday, we’d be racing up that peak. I searched the sky, trying to conjure the summit through the fog. Racers descent Skiddaw, with Keswick and its neighboring farms spread out below. Photo by James Carnegie. One day, in the summer of 1932, a Keswick innkeeper set out for the summit of Skiddaw, then on to Great Calva, Blencathera, Clough Head … Bob Graham had just turned 42, and in honor of his birthday, decided to link the summits of 42 fells in 24 hours. 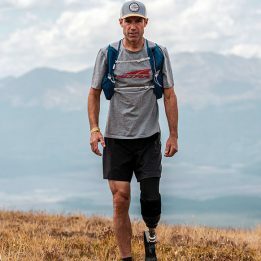 His chosen route covered 66 miles with roughly 27,000 feet of elevation gain. At the time, it was the most fells anyone had ever tagged in 24 hours (the record has since been upped to 77, where it has stood since 1997). 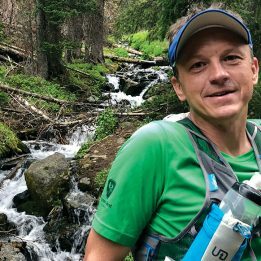 “Rounds” are to fell running what the Colorado peak-bagging challenge Nolan’s 14 is to American trail running: they are about route choice and aesthetic, and are often treated like a long-term project. Spinks has likewise held the women’s record for the Scottish and Welsh 24-hour rounds, named for the two men who created them: Charlie Ramsay and Paddy Buckley. Most recently, in 2016, she became one of a few tough souls to have completed a double Bob Graham—132 miles with 54,000 feet of climbing. Spinks’ 43 hours 30 minutes is the current record. There are countless other “rounds” as well: a standing challenge to link all 214 Wainwrights (Only three people have ever completed it. The record, set by Joss Naylor in 1985, is 7 days 1 hour 25 minutes. ); and the “Frog Graham,” which involves linking a series of fell tops, lakes and islands with a combination of swimming and running. 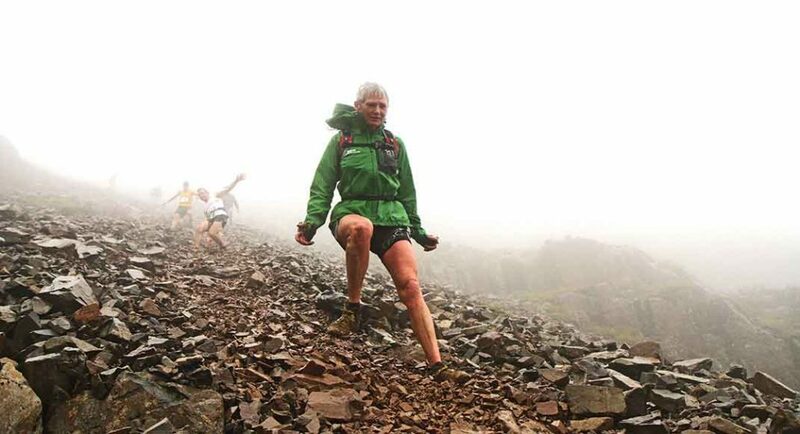 But the Bob Graham remains undoubtedly fell running’s most popular challenge. The current record was set clear back in 1982, when “King” Billy Bland, of Borrowdale, Cumbria, ran it in 13 hours 53 minutes. Plenty have tried to beat the time. The closest anyone has gotten is 38-year-old Ryan Smith, who ran it in 14 hours 17 minutes just this June. 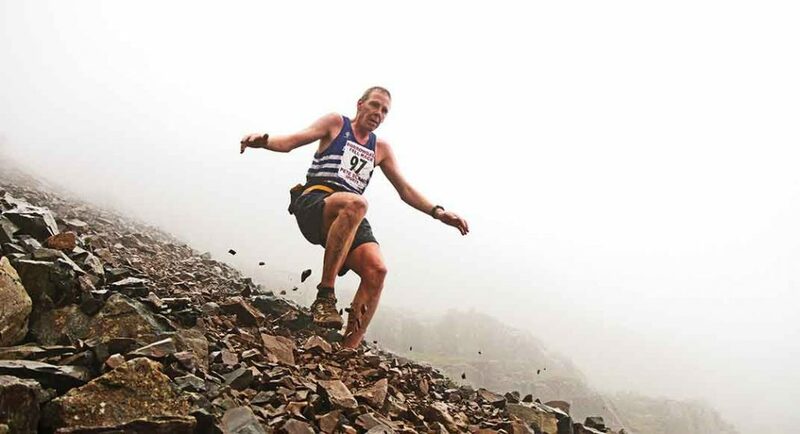 Nicky Spinks navigates a talus field during the 2014 Borrowdale Fell Race. Photo by Andy Holden. For most people, simply finishing in 24 hours is a lifetime achievement. 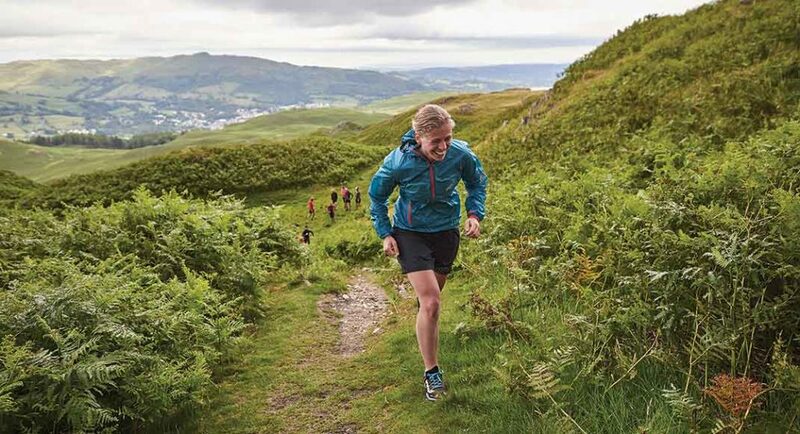 “On any given Friday night or early Saturday morning from May through September, you’re bound to see at least one group setting off on a Bob Graham attempt,” Hope explained as we walked up Keswick’s cobblestone main street. The round’s official start and end point, Moot Hall clock tower, stood at the center like a fountain in an Italian piazza. Bob Graham aspirants start from Moot Hall and make their way up Skiddaw, the first peak of the round, and then on to the other 41 peaks, ending up right back where they started. 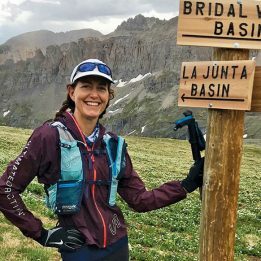 Despite the advent of GPS-tracking devices, runners are required to have someone else along to bear witness to all 42 summits in order to be considered valid finishers. Commonly, runners employ several pacers, one in charge of navigation, one in charge of food and another in charge of fluids. 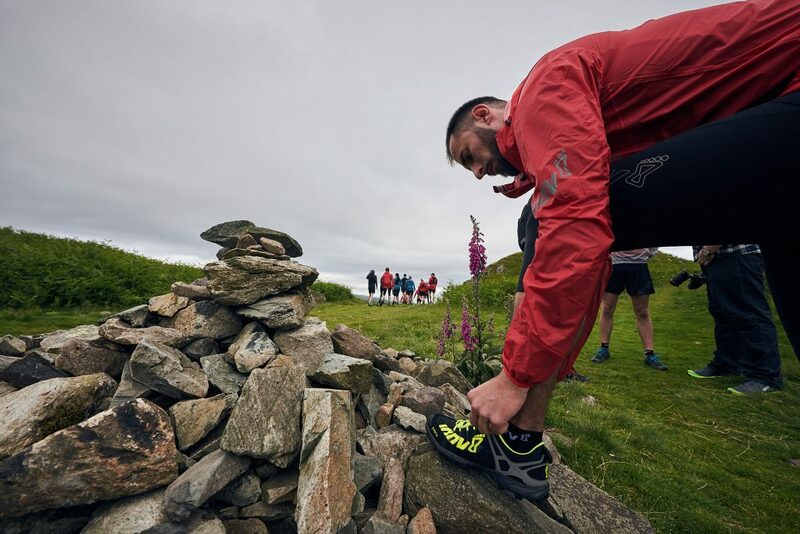 Most core fell runners have been a part of a Bob Graham attempt, whether running it themselves or crewing another runner. As we walked past the brick clock-tower building, a runner was preparing to set off on an attempt. A crowd of family and friends counted down the minutes as the runner strapped on his pack and posed with his pacers in front of the hall’s green doors. “Five, four, three, two, one,” the crowd chorused at one-minute to seven. “Off you go! See you later!” The runner and his two pacers waved and trotted away to hoots and applause. The author smiles through the pain. Photo by James Carnegie. After a night’s rest, we headed 45 minutes south to the town of Ambleside for a first taste of the fells. A half mile of paved, wooded lane led us through a wood-and-wire gate and, suddenly, to open pasture. Ben Abdelnoor and two other professional fell runners, Ben Mounsey, 35, and Mary Wilkinson, 36, both of Yorkshire, led us along a grassy footpath between low hills. We squelched through mud pits and hip-deep bracken, looking down on a valley of enchanted green hillsides lit patchily by sun filtering through a cloudy sky. A few miles in, we paused at the bottom of a short, steep pitch. Baseball-sized rocks and patches of loose dirt hid amid the bracken. Tall and lanky, with short brown hair and a youthful smile, Mounsey strided up the hill, turned around and barreled back down, arms pinwheeling, feet pistoning beneath a motionless torso. We each followed suit, our attempts clumsy and frenetic. In Askwith’s book, I’d read about the 1910 Burnsall fell race (1.5 miles with 899 feet of climbing), where a gamekeeper named Ernest Dalzell set a course record of 12 minutes 59.8 seconds. His time on the descent: 2-minutes 42 seconds. The result was so incomprehensibly fast that, for years, many locals didn’t believe he’d actually done it. To date, only two others have run the race faster, though many of the best fell runners have tried. Making adjustments on the summit. Photo by James Carnegie. Race day dawned gray and chilly, the top of Skiddaw still masked in cloud. At 11:15 a.m. we ambled over to Fitz Park, home base for the local football/soccer club whose clubhouse served as race headquarters. Runners mingled on the front porch, most everyone sporting singlets with the colors and logos of their town fell-running club—green and yellow for hometown Keswick AC, orange and blue for neighboring Borrowdale, blue and green for Ambleside. Everyone seemed to know one another. Inside, runners lined up to pay the £7 entry fee while others crowded into corners, pinning on race bibs and adding or stripping layers. I looked around for the crusty, weathered shepherds I had expected to find lining the start, but, as far as I could tell, there were none. “Do you reckon that someone’s gonna beat Kenny’s record?” A couple of lithe-looking runners clad in tights and technical shells stood talking along the railing. They were referring to the course record, set by Kenny Stuart in 1984. This year, due to erosion, Skiddaw race organizers were requiring runners to stick to the established paths. The jury was still out as to whether the course change should mean a new category of course records. His eyes gleamed with a vague smile as he recounted the race—now more than 30 years ago. Stuart stopped racing decades ago, due to a mysterious, undiagnosed illness that led to unbearable post-run fatigue. But many of his records—at Skiddaw, as well as Scotland’s Ben Nevis race and Wales’ Snowdon race—still stand. Ten minutes before the race start, everyone began to make their way toward the cricket pitch, where a taped-off box and a row of flags marked the start. A blond, rosy-cheeked woman stopped me to make sure I had the waterproof jacket and pants, hat, gloves, compass, course map and emergency food that are required at most fell races. The procedure became standard several years ago, after runners at a few races died getting lost in stormy conditions. I emptied the contents of my pack. Satisfied, she let me pass into the starting corral. Fell racers jostle for position on the descent. Photo by Andy Holden. The 136 runners sprinted off at a pace that was alarmingly fast given the fact that we had over nine miles and around 2,500 feet of climbing in front of us. After a few minutes of pavement, we crossed through a swinging wooden gate onto a dirt path that wound up onto the lower fellside. Sheep stared at us from the other side of a stone wall as we ran past. Stuart had warned us about the course’s main climb, a relentlessly steep half mile called Jenkin Hill. Within minutes I was upon it. A line of brightly colored singlets zigzagged up and over the horizon line. Everyone slowed to a power hike. “Well done!” A father and son stood along the edge of the path, smiling approvingly as we trudged past. A black and white shepherd dog sat at their feet. Every 100 feet, there was another group of onlookers, walking sticks, cameras and dogs in tow. All of them offered the same concise words of encouragement. I was barely halfway up Jenkin Hill when a green-shirted blur hurdled down the rocky path, followed closely by a blue-shirted blur: the lead runners. They careened down the path, looking ahead with a mixture of concentration and pain. There were still several miles and nearly 1,000 feet to go, so I doubled down my pace. Just ahead, an older, gray-haired runner chatted with a young boy, who looked no more than 14. “Have you done one of these races before?” The older man asked. “No, this is my first. It’s really hard!” The boy responded, breathily. I passed the duo, but my quads were already starting to bark at me, and within minutes I slowed back down. The older man climbed steadily past me. “Well done,” he said with a smile. An hour in (Kenny Stuart would have been nearing the finish line already), the grade eased back. A short, flat stretch skirted around a smaller fell called Little Man and then curved up toward the rocky summit proper. Almost immediately, I was in a different world. The miles of hillside and pasture disappeared beneath a cloak of fog. Wind turned my hands to ice and left me stumbling over blocky talus. Most other runners had already started the return journey back to town, and the summit plateau felt desolate and hostile. A fresh gust of wind threatened to knock me over. I’m going to be the stupid American that gets blown off the top of Skiddaw and needs to be rescued. Finally, through the mist, I made out the reflective yellow-orange of a summit-marshal’s vest. The blond, curly-haired woman peeked at me stoically through rain-speckled glasses, wisps of hair whipping about from under her hood. “Touch the summit cairn and you can head back down,” she continued, pointing to the four-foot cement pillar that marked the fell’s official summit. As I begrudgingly stumbled the remaining few feet, it occurred to me that this woman had been standing here, wet and windblown, for at least an hour and a half, and that she would stay here until the last racer had checked in. I patted the summit cairn, thanked her and turned back down the fell. Twenty minutes later, I hobbled back into Fitz Park. The crowd had moved back to the football clubhouse to munch on a potluck of cakes and egg-salad sandwiches. At the back, through a cafeteria-style window, a volunteer handed out tea and coffee. The same rosy-cheeked blond woman who’d checked my required kit earlier called everyone onto the porch. Prizes were laid out on a table: several bottles of fruit liquor, a pie, a box of cookies, a stack of books, gift cards to a local restaurant and three pineapples. One by one, age-group winners, club winners and overall winners were called to the front and invited to choose an item from the table. “And our overall men’s winner, Sam Stead,” the woman announced. A young man stepped forward and scanned the table. He grabbed a pineapple and lifted it in the air, grinning sheepishly as the crowd broke out in laughter and applause. As I limped back home for a warm shower and a beer, I couldn’t help but think that this was running in its purest form. No one had come out seeking belt buckles or giant cardboard checks. 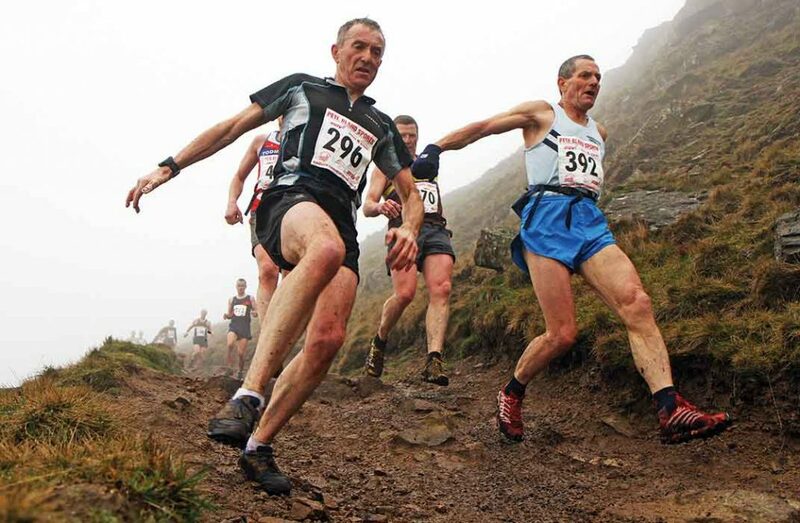 The biggest cash prize in fell running is roughly £150, for the Grasmere Guides Race. Many races don’t give cash prizes at all. The most coveted awards in all of fell running are what Proctor calls “perpetual trophies:” plaques or cups etched with the names of all previous race winners. The race winner takes home the trophy and keeps it until someone else wins the race a year or two or five down the road. Ariella Gintzler is an editor and writer living in Santa Fe, New Mexico.